We can cater anything from simple pizzas to full trays of our delicious entrees most importantly. 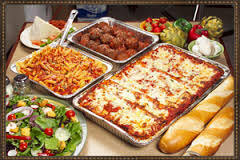 Brooklyn V’s can provide catering of authentic, mouth-watering Italian specialties for your catered event. Such as pasta, lasagna, pizza, meatballs and many more. Please Call us at (480) 207-7295 or feel free to send us an email; send to brooklynvspizza@gmail.com to discuss your catering needs! You can CLICK HERE to view, download, and print a PDF version of our Event Catering Menu. CLICK HERE for Corporate Catering options and ordering.